Protection and production of orchids in their natural habitats need to go hand in hand, and the involvement of local ethnic communities needs to be assured. This is the only way to prevent the exinction of wild orchids in the intensely utilized landscapes of Asia. "Dai Orchid", because it flowers during the Dai water splashing festival and is then used as an aromatic ornament in Dai ladies' hair. The species name means "chryso" = gold, "toxum" = seed. The "seed of gold" has been an essential and crucial element in pre-christian alchemy for creating gold. It was a mysterious substance, which aided the transformation of minerals into gold. As a "seed" it has always been present in the alchemists' concoctions. In the personal and spiritual transformations of the alchemists, the "seed of gold" is always present in a person, much as Yin is nestled as a "seed" in Yang, and ultimately triggers the necessary change. Therefore, personal spiritual maturity, which came about through a sequence of transmutations, aimed at achieving the golden change, which was synonym with the qualities of a true master, with longevity, and an all emcompassing state of love. 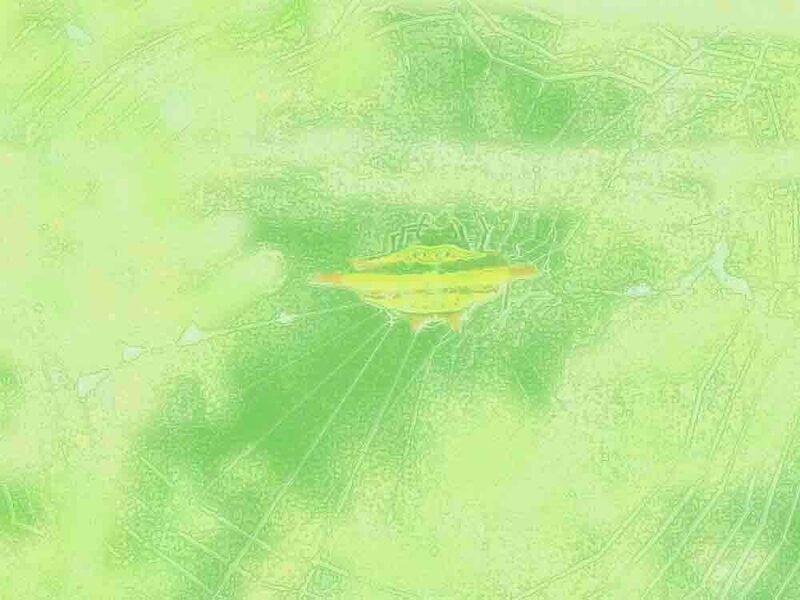 For this final stage of personal achievement, the "seeds of gold" were of pivotal importance. In Chinese medical philosophy, humans are borne in the state of Yang. Therefore, throughout life, the more elusive forces of Yin have to be added to a person. Hence, Yin tonifying plants are of greatest importance to TCM (Traditional Chinese Medicine) and are considered long-life medication. When drinking the tea of the flowers of this Gold Orchid, the effects on the more caring, harmonious, and restoring nature (Yin) can be felt immediately. 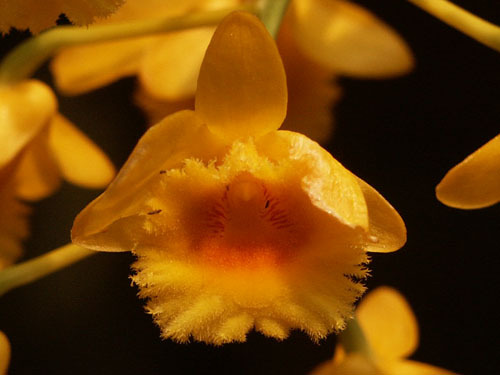 The gold coloured Dendrobium chrysotoxum in the hair of a Bulang lady. The other two species are D. nobile and D. crepidatum. 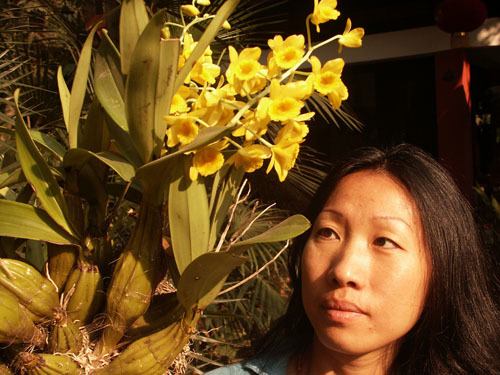 The flowers of the Gold Orchid are dried and used as tea. The aroma has a pleasant honey scent. Just one flower in a glass of water already infuses a distinct aromatic change. 10 flowers make a rich Yin invigorating tea. The flowers, can also be eaten, and after using them in tea, they can be used in bakery or marmelade. 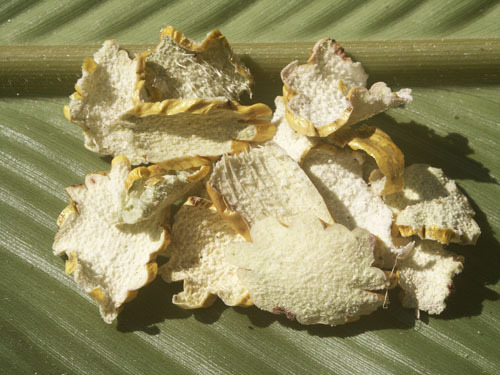 In traditional local medicine, the Gold Orchid tea is applied to strengthen Yin for a balanced Yin and Yang, for supporting feminine characteristica of harmony and reproductivity. 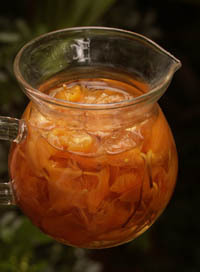 The "Gold Tea" contributes to happy moods and a sound sleep undisturbed by dreams. The genetic variability of the plants is high. Some flowers exhibit a slightly more dark red inner part. The all, howevere, flirt bees and people alike with their strong aromatic honey scent. Most Dendrobium species during dry season shed leaves and turn into plants that resemble a cactus. This is a perfect adaptation to the dry and sun-drenched habitats up in the trees. In extreme years they face 6 months without rain and their hosting tree might even shed its leaves. Therefore, Dai people traditionally planted this orchid on the roofs of their houses. Nowadays, with the ugly new roofs made from all sorts of artificial material (the old roof tiles were burned rice field mud), which for some odd reason have to be in the most artificial blue color, do of course not provide any suitable substrate for orchids. 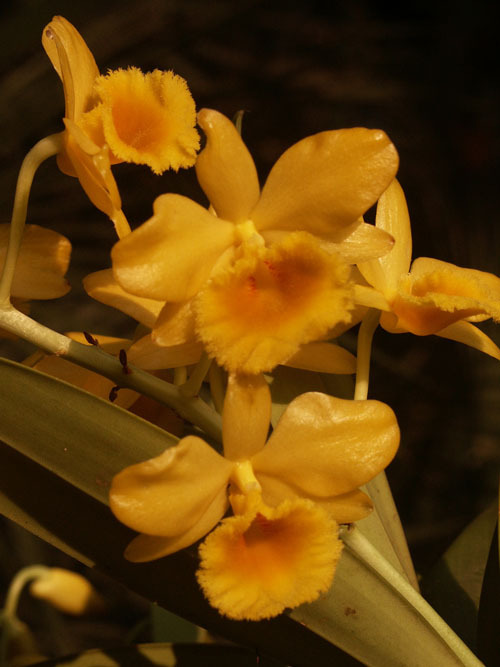 Also the stems of the Gold Orchid are used in Chinese Medicine. Recent scientific research found active polysaccharids with a proven effect on the immune system and for treating diabetes. Please see our store for immune system herbal orchid products. Most Dendrobium species during dry season shed leaves and turn into plants that resemble a cactus. This is a perfect adaptation to the dry and sun-drenched habitats up in the trees. In extreme years they face 6 months without rain and their hosting tree might even shed its leaves. 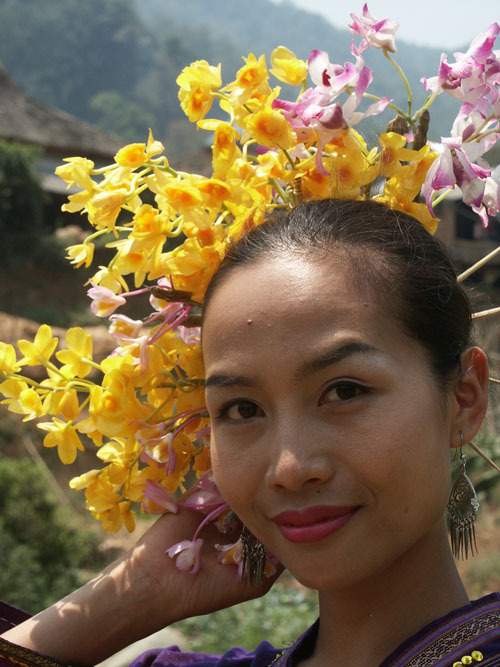 Therefore, Dai people traditionally planted this orchid on the roofs of their houses. We also specialize in cold tolerant orchid genus from South China, Tibet, North Myanmar (Burma), Northern Thailand, and North Vietnam.